I was working my way through the central market, I stopped to quiz a girl, is that citron, the lemon juice I like. I get an answer of Coca Cola. I hear this bullfrog noise, so I think why not go look at the river ditch an and see what is up. 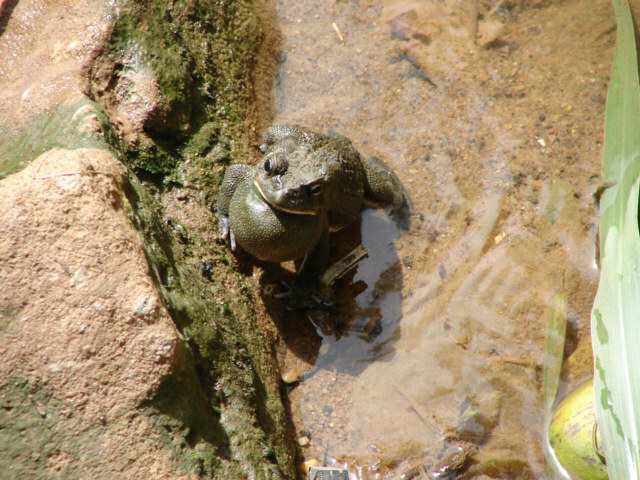 I find a mess of Frogs making Tadpole and this one bloater making noise. This is one of them National Geographic Photo moments, therefore I am thinking. I will give my finger a lick, hold it up, and check the wind. Has nothing to do with the Photo, however, I had this fleeting moment thoughts about F-stops, and shade, and letting it develop longer. I was saying to myself, I really should learn to do all the adjustment tricks. There was a mix of shade and sunny spots, instead of fancy camera work, I timed it when they swam to a good spot, except for the bloater, Mr. He, or Mr She did not move, kept bloating. He was acting like the bull ape of frogs. 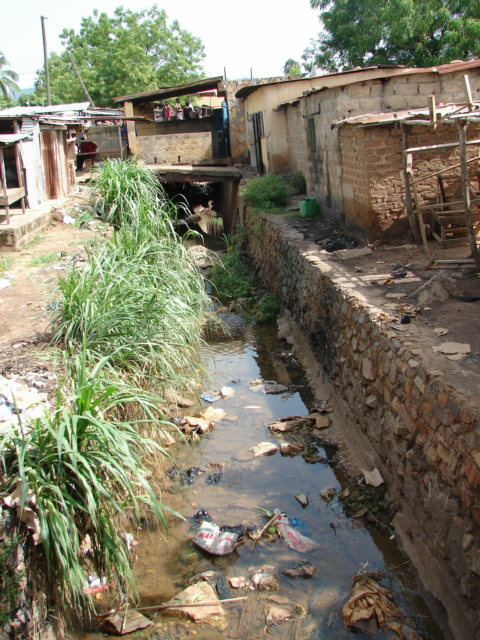 Photos of the ditch, river, stream that runs through the market. There was a heavy rain yesterday and the water came roaring through this ditch, cleaning the ditch and was exciting, as the water was at flood stage for about 10 minutes. These frog were making tadpoles, I would guess there was about 20-30 couples in the middle of the day, in the middle of the central market of Kpalime, doing it. I am learning continually how to take better photos. So far, I have not learned to do adjustment to the camera end, I do the adjustment to me, choosing the angles, the light and the timing and the shot. Nothing a 2000 Dollar Pro camera could not fix, or a graphic program. Note, I do not touch photos, except sometimes to label. You are getting what I see or saw. 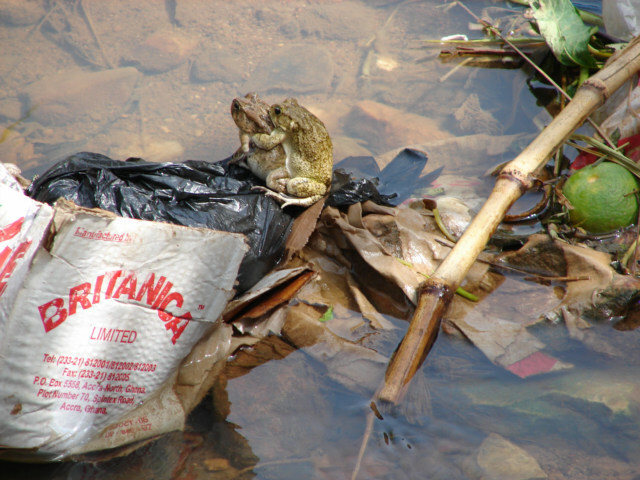 I think this frog is almost the same as Indiana frogs, sorry not the stereotype of Africa.